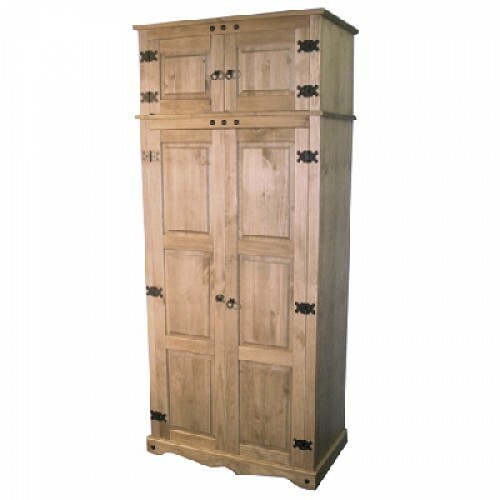 This sturdy Mexican Pine Wardrobe Top Box is ideal for use as extra storage made to compliment the 2 door wardrobe is made to a high specification from solid pine. As is shown each door has a single panel with two hinges each side. The hinges are constructed to a higher than normal standard as are the rest of the fittings. 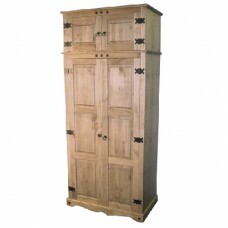 The Mexican Pine Wardrobe Top Box is manufactured by our associated factory in South America. Please Note: Wardrobe is shown for illustration purposes only and is available to purchase as a separate product. Top box is NOT a stand alone item, it uses the top of the wardrobe as its bottom. Only to be sold to compliment and enhance the Mexican Wardrobe. The Mexican Pine Wardrobe Top Box is representative of the actual item, as it is a natural product there may be variations in the shade or the cut of wood. Please note that the Mexican Pine Wardrobe Top Box, where applicable, all sides, tops and fronts are solid panels. The drawer runners are made from solid wood, not plastic. The backs and drawer bottoms are constructed from plywood not hardboard, cardboard or chipboard. When you buy this, you can buy with confidence because all of our furniture is built to exacting standards to ensure that, not only will it look beautiful and be fit for purpose, but it will stand the test of time and will grace your home for many, many years.